People move into tiny homes for dozens of reasons. They want to downsize or simplify, travel with their home, or enjoy nature more by being off the grid. Each homeowner has their reasons for choosing a minimal home, and their homes reflect their unique personality and lifestyle. Similarly, choosing to harness solar energy to power your home—no matter its size—is a personal choice, and there are options and packages for everyone. Happily, that includes residents of tiny homes. Tiny Heirloom, a manufacturer of customized luxury tiny homes, recognizes that each homeowner is different, and also celebrates these differences. If you’re thinking about going solar, the first step that we at Home Improvement Leadssuggest is to take your lifestyle into consideration. Do you want to go fully off the grid, or just try to reduce the cost of electricity substantially? Will you need battery or generator back-up? How often do you use electronic devices? Are you a night owl who needs light to work late into the night? One benefit of living in less space means that it requires less energy to keep it running. Opting for solar power doesn’t mean you have to eschew modern conveniences like electricity, but it is important to be realistic about your expectations behind installing solar panels. Once you understand how solar energy can work with your lifestyle, you’re ready to plan out where the panels will be installed. The location of your solar panels is one of the most important factors. Find a spot where your solar panels will receive the most direct sunlight during the day. Make sure this spot isn’t shaded by tall trees, your home, or anything else that would interrupt the path of the sun. Generally, south-facing locations are best, but again this depends upon any barriers between the sun and the solar panels. Remember, depending on your climate you may experience a significant number of cloudy days. Solar panels are still effective during cloudy or foggy days, producing 10-25% of their full capacity. Keeping your solar panels clean will ensure that your panels are receiving the most sunlight possible—even on cloudy days. After you’ve considered your goals for going solar in your tiny home and you’ve found a potential space to install the panels, it’s time to choose a solar package. Tiny Heirloom’s solar packages vary. A 2,800W inverterOne smart battery chargerSix batteriesA transfer switchOne solar controllerOne 400W solar panel. 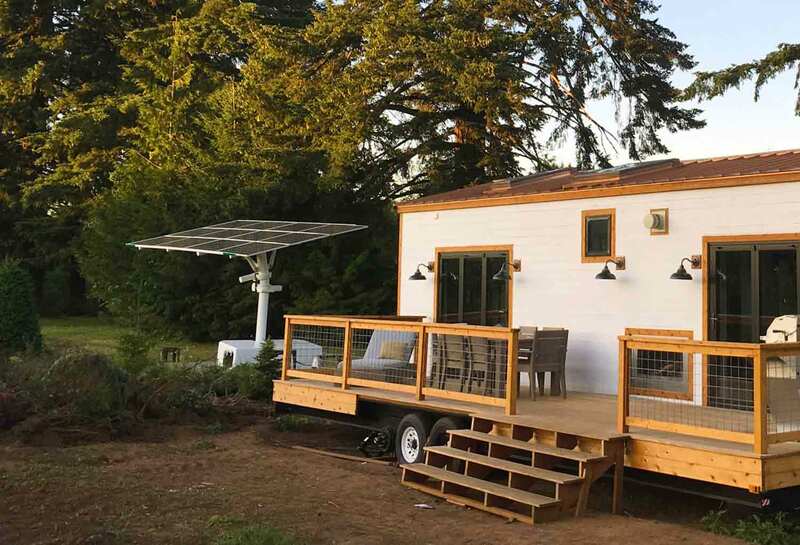 Their commitment to bringing solar energy to the tiny home community, and catering it to your needs is evident from the get-go. They understand that choosing to live in a tiny home means different things to different people: freedom, security, self-reliance, and privacy. Choosing solar power can mean just as much, if not more, for your way of life.